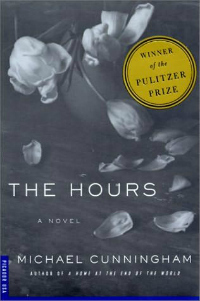 The Hours is a novel about women who spend too much time thinking about themselves, and are arguably the worse for it. I couldn't relate to it at all. But they are also women who closely consider the lives of others: their needs, fears, probable desires... As such, The Hours hums with emotion - relentless, sometimes thrilling, but often exhausting emotion. Cunningham weaves elements through all three narratives (writer, socialite, wife) in a way that builds momentum while it unravels the mystery of who these women really are. Physical objects, motifs, thoughts, impressions, behaviors - all are used as common reference points over and again in The Hours, until the reader begins to understand that the most complicated relationship each of the women has is, in fact, with herself. There she is, thinks Willie Bass, who passes her some mornings just about here. The old beauty, the old hippie, hair still long and defiantly gray, out on her morning rounds in jeans and a man's cotton shirt, some sort of ethnic slippers (India? Central America?) on her feet. She still has a certain sexiness; a certain bohemian, good-witch sort of charm; and yet this morning she makes a tragic sight, standing so straight in her big shirt and exotic shoes, resisting the pull of gravity, a female mammoth already up to its knees in the tar, taking a rest between efforts, standing bulky and proud, almost nonchalant, pretending to contemplate the tender grasses waiting on the far bank when it is beginning to know for certain that it will remain here, trapped and alone, after dark, when the jackals come out. You respect Mary Krull, she really gives you no choice, living as she does on the verge of poverty, going to jail for her various causes, lecturing passionately at NYU about the sorry masquerade known as gender. You want to like her, you struggle to, but she is finally too despotic in her intellectual and moral intensity, her endless demonstration of cutting-edge, leather-jacketed righteousness. You know she mocks, you, privately, for your comforts and your quaint (she must consider them quaint) notions about lesbian identity. You grow weary of being treated as the enemy simply because you are not young anymore; because you dress unexceptionally. You want to scream at Mary Krull that it doesn't make that much difference; you want her to come inside your head for a few days and feel the worries and sorrows, the nameless fear. ...brilliant and indefatigable Leonard, who refuses to distinguish between setback and catastrophe; who worships accomplishment above all else and makes himself unbearable to others because he genuinely believes he can root out and reform every incidence of human fecklessness and mediocrity. Discuss the overlap of character experiences or behaviors (such as avoidance of mirrors, hearing of voices, etc), and how it compels the action forward. How does illness break down the boundaries between characters? (Consider Laura and Kitty, Richard and Clarissa, Virginia and Vanessa...) How does it loosen underlying issues and allow them to surface? How does their mortality permit characters to more clearly see the whole of their lives, their place in the world? Laura's cake (and cake-making) as a metaphor for her life itself. Discuss. Explore the idea of "crossing over" in The Hours (consider literal moments such as the multiple street-crossing scenes, and figurative ones such as suicidal ideation or even the anticipation of a natural death). Suicide is a recurring theme in the novel, both as an abstract thought and as an actual plan of action. Compare and contrast two character's perceptions/experiences of it.